Natalia Urban was born in Moscow, Russia, where she received a Masters degree in Education. Upon her arrival to the U.S.. she decided to dedicate herself to medicine. Natalia now works at a Houston hospital where she helps trauma patients with their rehabilitation. Art for Natalia is a conduit for her inner self. By imbuing a piece of her soul into all her works, she hopes to make the world a happier and kinder place. PSST: Natalia, you have been a member of PSST for a year or so. We love that you frequently bring new people to our meetings. What has helped you the most in being a member? Natalia: PSST has definitely provided me with much of my inspiration and growth as an artist. First and foremost, being around other artists helps me get inspired by their own works and diverse outlooks on art. And, of course, the workshops have been instrumental in my learning and improving various techniques I might have not otherwise explored. They really help me get into a creative flow. Natalia: A part of my apartment is dedicated as a studio. It is an ever growing and evolving room. Perhaps, it is the most living part of my home, and I do have more potted plants than statistically probable. All of the different techniques I work with are well represented in the studio on works both completed and in progress. Organization is also very important to me, so the studio looks rather spartan to most artists that have been in my home. It is not unusual to find a stray cup or teapot near my easel. A good cup of green tea helps me to relax and gives time for clarity. PSST: Flowers are your most favored subject. How do you describe your painting style and choice of colors. Natalia: Style is a hard thing to talk about introspectively. The workshops organized by the PSST help me unlock new techniques that help my style grow and evolve over time. Similar to a finding new puzzle pieces that fit together into a larger picture - I feel like the picture is already there, continuing education helps it come together. 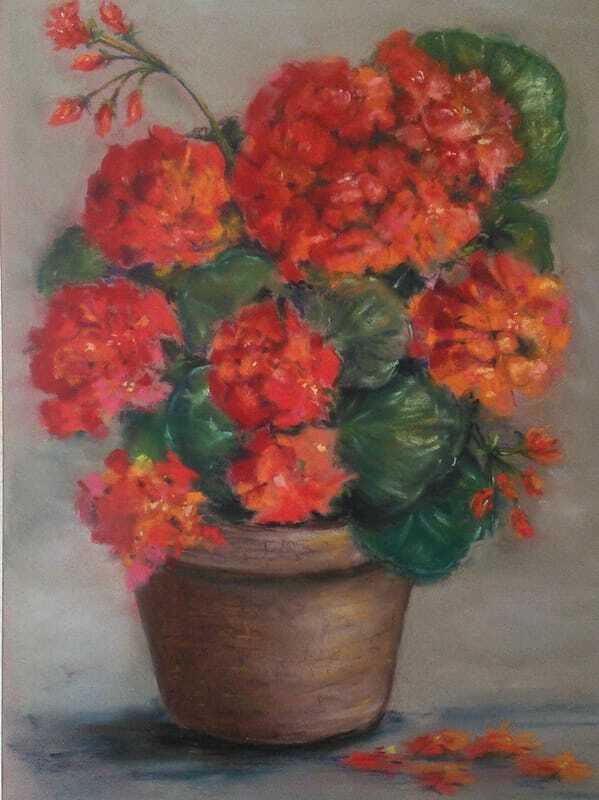 The color palettes often do stem from my favorite subjects - flowers. The different flowers are like the tapestry of personalities that make up humanity. Flowers, like people have their own characters that are made of emotions and traits both obvious and subtle. Wildflowers hold a special place in my heart and imagination because they remind me of my childhood - a time less constrained and arguably fueled by a strong feeling of nostalgia. 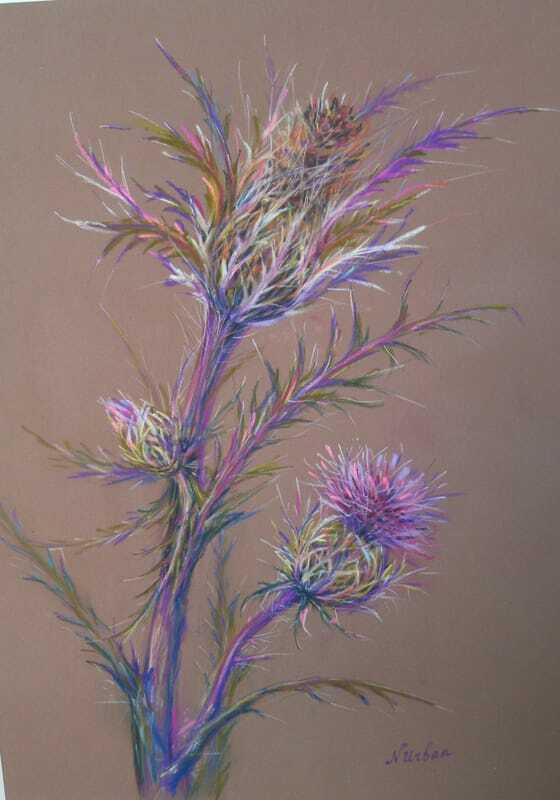 Most of my pastels are inspired by the wildflowers I encounter during my travels and hiking. PSST: You have a beautiful website, showcasing not only your pastel paintings but your murals, drawings and other media. Did you design your website? How has it helped with sales and contacts? Natalia: The website allows me to share some of my works on the internet. I really wanted something that people could explore on their own, and I divided it by categories instead of chronologically because I feel like people usually are drawn to their favorite style. I also wanted a simple, traditional layout. This led me to a design from Elmastudio in Germany, which specializes in minimalistic designs. Art for me is a way to connect with people. All of my works I have donated or gifted to people. I would like to think that all of my drawings have already or will eventually find a home where they were meant to be. PSST: Please share your favorite tips on marketing, exhibiting, or social media? Natalia: Social media is something I am still just starting to explore. A thing that lets me create a connection with people is a unique set of business cards. I have many different works printed on the backs of them and I ask people to choose one that they like best. This really helps start a conversation about my artwork.